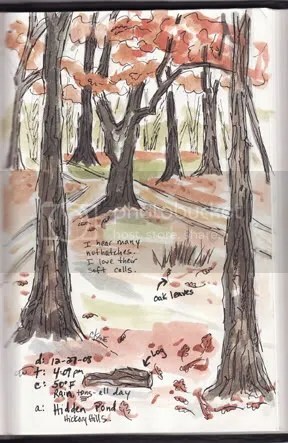 Nature Sketch from your Car Window – Let's Paint Nature! Once again Chicago has dealt us a wicked weather hand. In a mater of a few hours, 4 inches of snow has melted and 3 inches of rain had fallen. It was just yesterday that single digit temps reigned the daily forecast, but now we are greeted with a mild 60°F, at the end of December!!! That makes for some instant flash flooding. 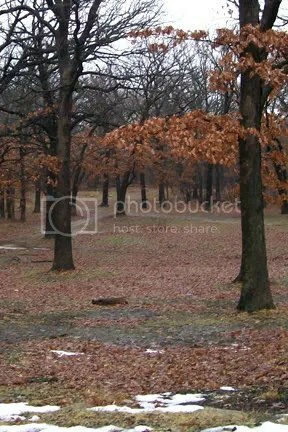 No mind, this wacky weather won’t hinder my nature love! Because of the Holidays and family obligations, I have been hard pressed to escape to the woods. Believe me, after a few weeks I can feel it. I belong in the woods. Maybe I’m too sensitive or just high strung….but when the world gets hectic I need the silence of the great oaks, the protection of the deep forest. It calms me. Today I had just a few hours to spare…and feeling desperate…..
Torrential downpours will not stop me from sketching…I’ll just do it from my car window! My perspective is slightly different from the photo because my focal point is that lovely oak tree at the point where the two paths meet. I love the way that tree looks! Such a fitting landmark at an intersection! The snow has disappeared overnight and today the warm colors of autumn are revealed again. For how long, I do not know. I hear a constant patter of rain on the wet oak leaves and louder patter on my metal car roof. It’s so loud. I love it. This will hold me over until the next hike. For a little bit anyway. Chris- I can certainly feel for your need to be in the woods. Yesterday Megan and I ventured out and it felt great, almost like spring was here- we hit a record high of 68! It is surprising to still see leaves on the oaks! Your sketches are lovley! Our snow has pretty well melted due to much rain..can’t wait for Spring! Wishing you a Happy New Year! I love it – it looks like a wonderful place for a walk! I am right there with you. We escaped with a trip to the seashore….that was delicious. I really needed to feel some warm air and sunshine on my face. It does wonders for the mood and the spirits. Little doses can go a long way to seeing me through the winter’s rages. Tom: I hear ya brother! We need nature. How wonderful to get a little spring time break once in a while. I’m glad you guys were able to enjoy it! Naturegirl: Happy new year to you too! And thanks! I too am looking forward to new seasons. JJ: Thank you! I know I would love, love, love, loooovveee living in the woods!!! Someday when I retire…I think I just might. Have a wonderful New Year to you and your family! Shelley: Thanks! I’m so thankful to Chicago’s Cook County, preserving land and not selling it to destructive money making developers! WEEEE!!!! I am not a paid sponsor by-the-way, he, he, he, just a thankful hiker! Barb: I hear ya! How amazing it can change your mood….almost magical! If we can bottle it, we’d be millionaires!!! Pingback: Hidden Pond Sketch « Let’s Paint Nature!